A birthday celebration is the absolute perfect reason for a Vegas pub crawl! We’ll get especially excited if it’s a 21st birthday. 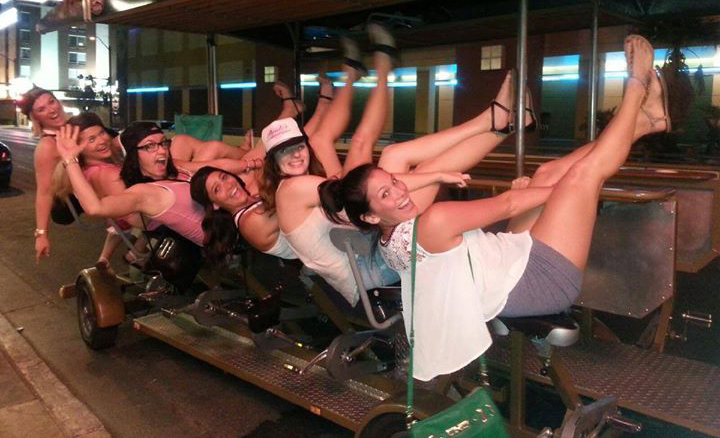 Bring decorations for the cycle pub and visit all of the best bars in Downtown Las Vegas. A pub crawl is a great way to get all of your friends together on a birthday. Our guides work to get everyone in the spirit, and the cycle pub provides the perfect meeting point for the group. We may live in a dream world here, but we think a pub crawl is a great way to bond with co-workers. Head Downtown after the office closes, and celebrate a colleague’s work anniversary, landing a big client, or something wild like making it to work on time every day for a week! Get some couple friends together and go on a triple or quadruple date! You’ve done enough movie, concert, and dinner dates. It’s time to let loose with your sweetie and friends on a Vegas pub crawl. Your guide won’t even make too many gagging sounds if all of you are canoodling between bars. An excuse to get out of town guests out of your house? Yes, please! Meet us Downtown, and we’ll take over the job of entertaining your third cousins who are just too cheap to pay for a hotel. Or, if you’re lucky, your best friends! We really have more fun when it’s your best friends. Either way, bring your tourist friends downtown for a Vegas pub crawl, so they can get to know the real Las Vegas. Check availability and book your next visit with Vegas Pub Crawler now. Our guides will take you from one bar to another and make sure you have a great time in between. Don’t spend your next date night watching Liam Neeson escape another unrealistic catastrophe while sharing a $20 bag of popcorn. Do something exciting. Book a crawl!